Died: September 1, 1866 at 45 yrs, 6 mos. 1. infant daughter Keith; (February 12, 1842 – February 12, 1842; She is buried in Cataumet Cemetery. 2. Charles A. Keith; (September 21, 1843 – January 11, 1844); Charles died at 3 mos, 21 d.; He is buried in Cataumet Cemetery. 3. Julia E. Keith Fish Bibber; (December 4, 1844 – Abt.1922); Married (1) Nathaniel B. Fish (Abt.1839 – 1880) (Roland Fish & Lucy B. Pope) in Fairhaven Ma. on January 8, 1868; She married (2) John Sowle Bibber, Capt. (1844 – ?) (Elisha Stover Bibber & Anna Webber) in Fairhaven Ma. on December 21, 1893; John married (1) Lettice Ann W. Curtis (1842 – 1892) (Paul R. Curtis & Lydia Ann Nason). 4. Frederick F. Keith; (May 31, 1846 – February 12, 1847); Frederick died in Pocasset Ma. at 8 mos, 12 d.; He is buried in Cataumet Cemetery. 5. Mary F. Keith Eaton; (September 11, 1848 – ? ); Married Frederick Eaton (1846 – ?) (Frederick Eaton & Catherine Kern) in Boston Ma. on March 13, 1873 & had two daughters; Frederick married (2) Ida Leona Travers Wright (1850 – ?) (Gilbert Travers & Elizabeth Hayes) in Detroit Mi. on August 6, 1891; Ida married (1) (–) Wright. 6. 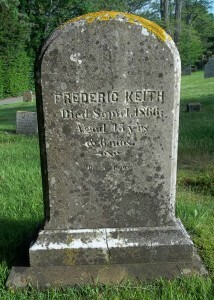 Frederic Aberdeen Keith; (December 10, 1856 – May 28, 1929); Married Eliza B. Gifford (1858 – ?) 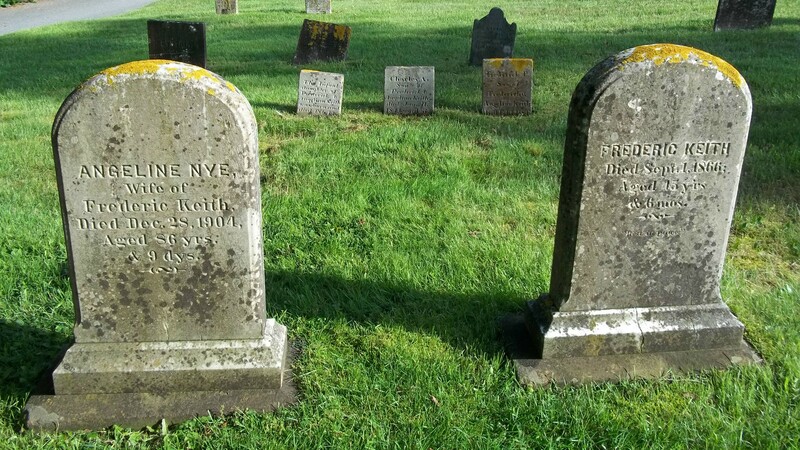 (James N. Gifford & Adeline H. Beetle) in Fairhaven Ma. on June 1, 1883; Frederic is buried near his parents & three siblings in Cataumet Cemetery.